HALLMARK 2007 Christmas Tree ORNAMENT~~ Gold Crown Exclusive ~~ 4 1/2" H ~~ This is the TUSKEN RAIDER STAR WARS: A NEW HOPE 30TH ANNIVERSARY ORNAMENT. Hallmark Stores got only VERY limited amounts & these SOLD OUT fast within hours at the Ornament Premiere in July 2007. Don't lose out. 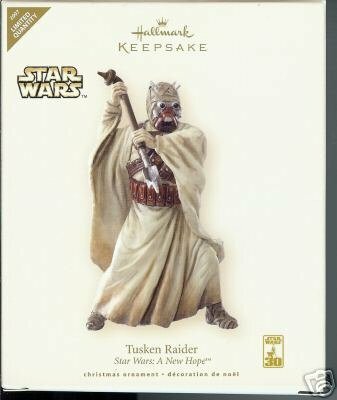 Items Similar To "2007 Hallmark~STAR WARS~Tusken Raider LIMITED ED Ornament"